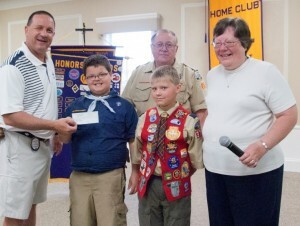 In an unusual turn of events, the Breakfast Optimist Club of Warsaw, Indiana was the recipient of a donation from Cub Scout Pack 3736. The money was earned by the scouts at the Optimist Club's car show and was returned to help support the many youth oriented activities carried on by the club each year. A quick visit to the Warsaw Optimist Club website told me that it is a very active club and I was quite impressed with the calendar of events scheduled from now, May 31, 2013, to September 10, 2014. Interestingly, the club's calendar is front and center on its home page. That tells me, the Warsaw Optimist Club is all about action and from the donation from the young scouts, I think they are about inclusion and collaboration as well. Good job to all! I've belonged to a listserve for Optimist Club members for about five years. The unofficial service has existed long before that; I think it was established in 1998. Even with that longevity, it hasn't garnered a large following, but it has generated a loyal one. One of the loyal participants has contributed a daily thought to the forum every day that I can remember. Some I really like, some not so much. 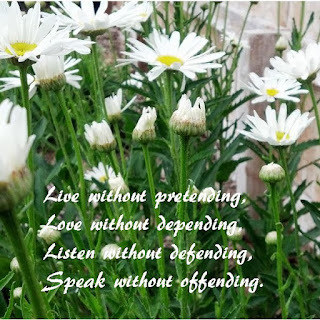 Many are sayings that I've heard before, sometimes attributed to different author, but they always do one thing. 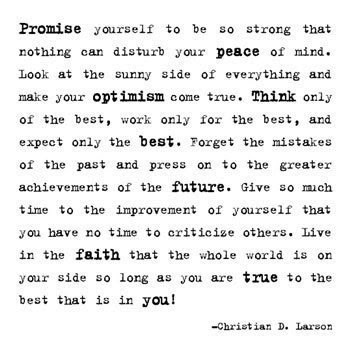 These daily quotes make me think and reflect. Several participants randomly respond to her musings when it touches them in a certain way, but I would venture to say that most often the reader does the same as I. They read, think and then delete. Today I want to share her thought on the Experience Optimism blog. She didn't give attribution to this little poem, but it sounds like a recipe for a happy life. Why not give it a try? One might think that a list that long covers everything, but they would be wrong. Additionally, the Truckee Optimist Club awards four scholarships to high school graduates each year. The scholarships range from $2,500 to $4,000 each. The club's ability to fund these important projects comes from the success in their community events. Namely, the Cannibal Car Cruise, Christmas Tree Sales, and the Brew Fest. The Truckee Optimist Brew Fest is what caught my attention today because it is fast approaching. It will be held on Saturday, June 8, 2013, 1:00 to 5:00 p.m. Attendees will taste specialty brews from Northern California and Nevada breweries, enjoy live music and lots of fun at Truckee River Regional Park. They say it's a great way to kick off the summer. I agree! It's also a great way to support the community. 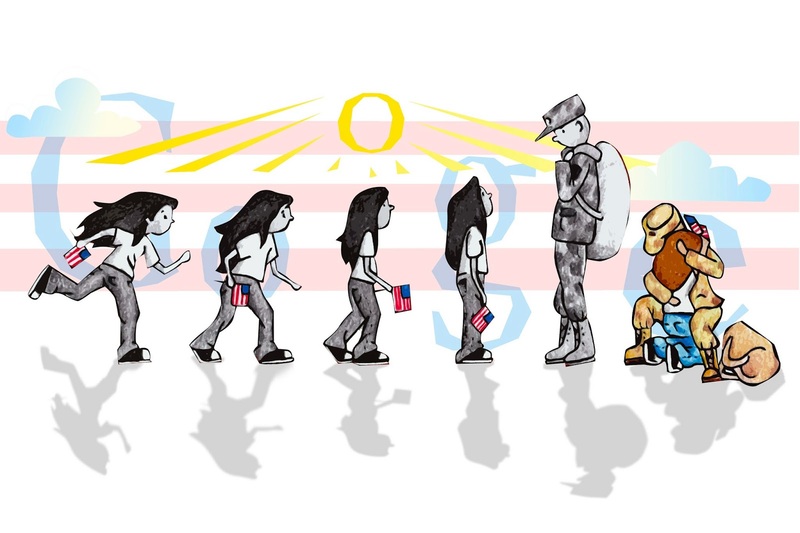 Google has announced the winner of this year's Doodle 4 Google competition. Artist Sabrina Brady of Sparta, Wisconsin will have her doodle featured on Google's home page on May 23, 2013. Sabrina is a senior at Sparta High School. In addition to seeing her art on Google, she will also receive a $30,000 college scholarship, a Chromebook computer and a $50,000 technology grant for her school. 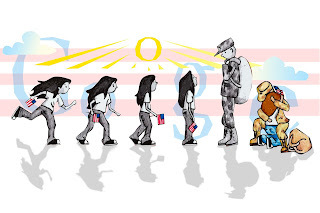 I always love Google doodles, and the Doodle 4 Google competition fits nicely with the youth serving projects that Experience Optimism highlights. According to a press release from Google, the young artist expressed the theme for this competition, "My Best Day Ever...," by sharing the heartfelt moment of being reunited with her dad after his 18-month deployment in Iraq. Through her art and exposure on Google, her emotion can now be shared by all. Fishing derbies are a popular Optimist Club activity. Where else can you teach traditional values and patience, and enjoy the outdoors at the same time? The latest Optimist Club to share a video with me about their fishing experience was the Optimist Club of Bixby, Oklahoma. Hope you enjoy! This month throughout the Optimist International organization, districts are holding their quarterly meetings with three major issues on their agendas. First and second are the Optimist International Oratorical Contest and the Communications Contest for the Deaf and Hard of Hearing. The district finals are held at this time and students are awarded scholarships for their presentation skills. The third item of business is the election of lieutenant governors for the next administrative year that starts on October 1. Lieutenant governors are an extension of the district and Optimist International for they provide a friendly face to the clubs in their zone (a geographic region of approximately 5 clubs) and serve as a conduit for information and source of inspiration. Their job is to help the clubs in their area succeed. Several years ago, Optimist International removed the requirement that a district must elect or even have lieutenant governors. As I only recently became aware of this fact, I don't know the reasoning behind the move, but I imagine that it had something to do with recruiting people for the role. It has become increasingly difficult to get individuals to step up and take this position and those who do become lieutenant governors often fail to live up to their commitment. Once considered the next step in leadership after being a successful Optimist Club president, it would seem that the role has become irrelevant. But that doesn't mean the organization should simply throw it out. They should instead rewrite the job description for the 21st century. The role of lieutenant governor is the best place to begin to form brand ambassadors to promote the purposes of Optimist International. Instead of asking them to visit the Optimist Clubs in their zones and checking off a list that certain standards are in place, ask them to teach the value of belonging to the Optimist International community and share the programs and resources that the umbrella organization provides. Ask them to reach out to others and share the opportunities that a new Optimist Club could bring to their area. Most of all, ask them to share the news about the good deeds performed by Optimist Clubs via the myriad of social channels that are available to them. 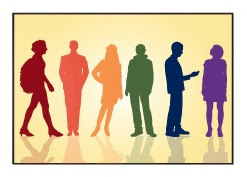 By redefining the role, we would get new and different personalities to apply and vie for the opportunity. These individuals would come with distinct skills including teaching, speaking, motivating, writing, and more. Understand that I have eliminated the word "lead" from this particular position. Leaders are important, we need club presidents and district governors to perform administrative functions; but in today's world, we are all leaders and we are all followers. The open culture allows us to do it all, to lead when needed and fall back when others' skills are better suited to the task than ours. The organization that we choose for fellowship and community service should allow us to do it all as well. When we embrace an open culture, we allow for equality, transparency, and cooperation. Furthermore, we encourage participation and participation engenders growth. The Optimist Club of Jerome, Idaho has a few favorite projects. As membership has declined over the years, they've promised the community and themselves that there are some that are just too important to let go. They fear that no one would step up to fill the void in the community, plus, these particular projects make the children, community and Optimist Club members feel good. Those special programs are Coats for Kids, Breakfast with Santa, Easter Egg Hunt, and the Special Needs Fishing Derby. The Special Needs Fishing Derby took place on Monday and more than 140 students came out to fish. They were met by volunteers, Optimist Club members, high school mentors and other volunteers, and treated to a day of catching some whoppers - up to 5 lb. trout - thanks to the Clear Springs Trout. Everyone went home with smiles and memories, thanks to the Optimist Club's promise to care. Watch a video from KMVT here. It's possible that I'm being overly critical with the observation that I am going to share today. It's also possible that I don't know the whole story, but I'm going with my perception, for what it's worth. Today I noticed on LinkedIn that one of my contacts listed his wife's achievement as his own. She earned a Queen Elizabeth II Diamond Jubilee Medal, an honor given to individuals in Canada to honor Her Majesty for her service. If he had received it, I know that he would have been included in this picture, and if not the picture, the story that accompanied it. Seriously, as if women don't have enough trouble being recognized for what they do, now some men feel the need to usurp their well-deserved recognition as well? 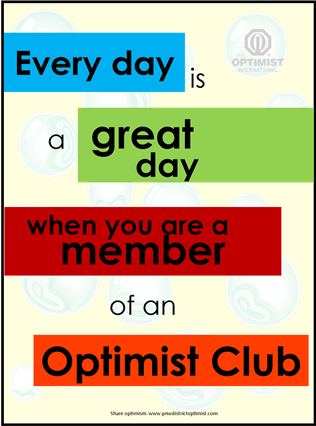 Optimist Clubs and members respect and most live by the words of the Optimist Creed. 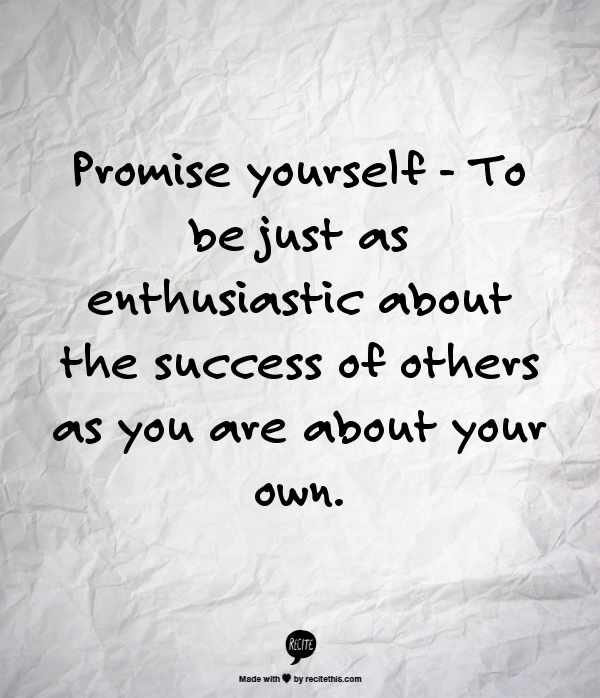 One of the tenets is "Promise yourself to be just as enthusiastic about the success of others as you are about your own." It reminds us to be a cheerleader for others. I know, and Sheryl Sandberg and the Lean In organization are certainly making it well-known, that women deserve champions. I encourage all men, please start with your wife, daughter, mother, sister or just a good friend. Tell them why they are great, and then tell the world as well. 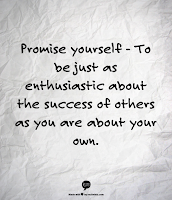 Your words of encouragement will help them feel good about their skills, and proud of their accomplishments. It will also help others discover their worth. For your next step, do the same thing at work. Help a female coworker get a promotion, raise or at least the acknowledgement she deserves for the value of the work she does every day. When we do this, women and men working together to help each other get ahead, we can make the world a better - and more equal - place to live. Oh, and in case my message was oblique, please don't steal the hard work or honors of others. That's just not nice, not to mention, it's unprofessional. According to Facebook’s 2013 Q1 financial report, there are approximately 350 million photos uploaded to the site every day. More than 1.3 trillion likes have been recorded on photos, status updates and pages since the site was first launched in 2006. That is a lot of sharing between people around the world and helps move Facebook ever forward in its mission to make the world more connected. I manage the Facebook page for the PNW District – Optimist International. It’s a modest page with 226 likes where we try to post inspirational notes and sayings on a daily basis. Those notes are intermixed with links to stories on the PNW District blog about PNW Optimist Club projects, but it is the pictures that get the most attention and garner the most likes and shares. My view is that people, once they arrive to Facebook, don’t want to leave so those links directing them to other websites get fewer clicks. Human beings are very visual. It is one of their strongest sensory perceptions. Social media sites like Facebook, among others, have made visual marketing a trend and brands have quickly adapted. Consider the tweet sent immediately by Oreo in response to the blackout at Super Bowl 2013. The brand’s quick wit and creativity was shared and shared again on social media sites. Once content was king, but now we know that a picture does more than merely say 1,000 words. Pictures share emotions and they can be digested, no pun intended, and shared quickly. In social media sharing is gold. My advice today: make your statement about your brand easy to share. Since my brand of choice for this blog is optimism and the experience of participating in an Optimist Club, I chose the accompanying visual. Tweet, share and pin away because the sentiment is true. 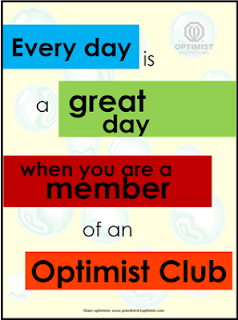 I invite you to find out for yourself how great every day can be and you will when you join an OptimistClub near you today. George Ohan, president of the Optimist Club of Hollywood shares his video production skills with a video of the Junior Blind Olympics 2013. The Optimist Club supports the program through the Optimist Blind Youth Association. Youth, ages 6-19 , are invited to participate in the annual event where they will gain confidence, friendship, and a true sense of accomplishment through competition. All events are adapted and coaches are on hand to instruct along the way. No experience is necessary for the athletes. Some Google alerts are better than others. I get a kick every time I open one with a link that takes me to the smiling faces of Optimist International Oratorical Contest participants. The students in this photo competed in the Breakfast Optimist Club of Spartanburg, South Carolina Oratorical Contest and earned medallions and cash prizes for their skills. 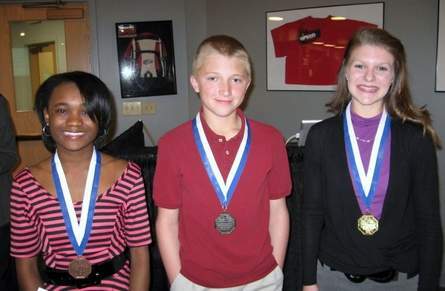 The winners shown here are: First place, Savannah Young of Boiling Springs High School (medallion and $100); second place, Drew Hendrix of Gable Middle School (medallion and $50); and third place, Terin Tyson of McCracken Middle School (medallion and $25). As with every Optimist Club Oratorical Contest, winners advance to the next level of competition earning them the opportunity to compete for a $2,500 scholarship. Funded by the Optimist International Foundation, more than $150,000 is given away each year for students to use in their college education. All students, regardless of location, compete by making a 5-minute speech on the same topic. This year, students are exploring, "Why My Voice is Important." The contests must begin at the club level. Competition will be completed in all areas by June 15, 2013. Thanks to the Spartanburg Breakfast Optimist Club for the photo. See more Optimist International Scholarship contestants on Pinterest. The PNW District - Optimist International is participating in Idaho Gives today, May 2, 2013. Idaho Gives is an online fundraising campaign and many nonprofit associations across Idaho are participating. They have posted their causes on the online tool Razoo and sent notices to supporters and others that they should contribute now...today...don't wait. The Idaho NonProfit Center has also secured sponsors for this one-day event. In addition to receiving contributions for their missions, the registered nonprofits are also competing for prizes to be awarded to the nonprofits that raise the most money. At 9:00 a.m., sponsor St. Luke's said that more than $100,000 had already been raised. As of 10:30 a.m., the amount had risen to $174,000. That's pretty awesome. Find out more and make a donation. The PNW District - Optimist International cause is the Communications Contest for Deaf and Hard of Hearing students. The district has a long-term goal of raising $10,000 to endow this scholarship for students with special needs.